UCF’s Cyber Defense Team has started the new year by taking top honors in the Collegiate Cybersecurity Championship Cup competition on Jan. 6. During the competition year, UCF students participated in 21 individual cybersecurity competitions and ranked highly in all those events, which is why they were named the winners. UCF’s best competitions during the 2013-2014 season included finishing 1st out of 180 teams in the 2014 National Collegiate Cyber Defense Competition, placing 6th out of 1383 teams in the 2013 CSAW CTF Competition, and placing 6th out of 193 teams in the 2013 Sharif University CTF Qualifications. As of January 5, 2015, CTFtime.org ranks UCF’s “Knightsec” CTF team 72nd out of 6207 international teams and 12th out of 260 US teams. The Collegiate Cyber Defense Club at UCF was founded in 2012 with the goal of fostering an information security-aware generation in Central Florida. The club hosts weekly meetings to educate the public. Student club members have the opportunity to participate in these competitions. 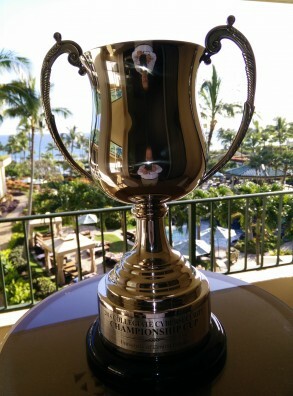 Nedorost accepted the trophy cup at the Hawaii International Conference on System Sciences (HICSS), one of the longest continuously running scientific conferences. Now in its 48th year, HICSS brings together highly qualified interdisciplinary professionals addressing issues in the areas of computer science, computer engineering, and information systems in an interactive environment.